Succulents evolved to survive extremely dry conditions by storing moisture in their leaves, stems and roots. This causes them to grow thicker evergreen leaves and take different forms. Many types of succulents flower during the summer and tolerate hot temperatures. Others tolerate cold temperatures and develop spines for protection. Nearly all succulents enjoy growing in full sun exposure with at least six hours of direct exposure. Several varieties of succulents produce dramatic floral displays during warmer months. One succulent grown for its flowers is the kalanchoe (Kalanchoe blossfeldiana), which grows best in U.S. Department of Agriculture plant hardiness zones 10 through 12. The showy flowers appear in large clusters above the dark green leaves. This succulent is available in varieties with red, pink, salmon or yellow blossoms, which last for weeks. “Rosy Glow” stonecrop (Sedum “Rosy Glow”) reaches 8 inches tall, forming a mound of bluish-green leaves 12 inches wide in USDA zones 3 through 9. The tiny, ruby red blossoms form large clusters in the fall, attracting butterflies to the garden. Some small succulents grow and expand, forming a low-growing mat, which acts as a ground cover in desert gardens. One short succulent is the little pickles ice plant (Othonna capensis), which is also known as the cape aster. This 2-inch-tall succulent forms a dense mat of pudgy blue-green cylindrical stems spreading 8 inches wide. Pearl-size deep pink buds appear in the spring and open into small, yellow, daisy-like blossoms. This succulent blooms from spring through autumn in USDA zones 5 through 10. Moonstones (Pachyphytum oviferum) grow best in USDA zones 9 and 10 with fat, pale blue-green leaves. These fat leaves form mats 4 to 6 inches tall and wide. Many sun-loving succulents form rosettes, which is a spiral formation of their leaves. One rosette-forming succulent is the Ferdinand agave (Agave ferdinand-regis), which reaches 18 inches tall and wide in USDA zones 8 through 10. This slow-growing succulent forms rosettes of black spine-tipped leaves with white accent markings. This agave sometimes blooms in late spring to early summer. Spiral aloe (Aloe polyphylla), in USDA zones 7 through 9, produces a distinct clockwise or counterclockwise spiral pattern made up of spiky dusty blue leaves with green tips. This 12-inch-tall and 24-inch-wide succulent rarely blooms with orange tubular flowers in summer. Variegated succulents add interesting color to the desert garden landscape. 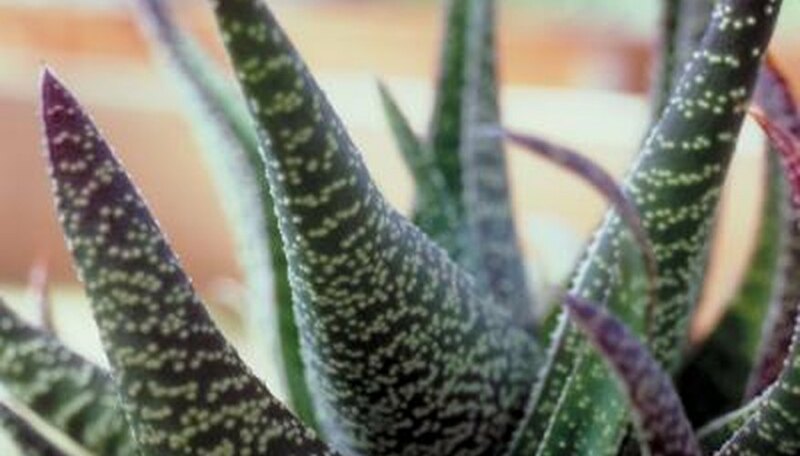 One striking succulent is the tiger aloe (Aloe variegata), which grows dark green leaves with contrasting white spots. In USDA zones 9 through 11, this plant reaches 12 inches tall and wide with showy pink summer flowers. Tip Top aeonium (Aeonium arborescens Tip Top) produces tight rosettes of burgundy leaves that fade to pale green near the center. This succulent reaches 12 inches tall and 12 to 24 inches wide in USDA zones 9 through 11.